Throughout history, religious Christmas observances and associated celebrations have taken very different paths. Christians have traditionally used December 25th to celebrate the birth of Jesus Christ. And while most consider Christmas to be a religious holiday, secular revelry has played a significant role in defining holiday traditions for Christians and non-Christians alike. One might assume that the disconnect between the religious significance and secular excesses of Christmas is a product of modern society. In actuality, the tension dates back for centuries. England experienced political turmoil after Cromwell’s death in 1658. The English monarch, Charles II, was restored to power in 1660, and Christmas celebrations returned to England. Puritan views continued to shape the holiday, as Pilgrims sailed to the colonies in 17th century. Public Christmas celebrations were again discouraged. The Massachusetts Colony outlawed public displays and levied fines against those who ignored the law. The Southern Colonies, a large stretch of land between Virginia and Florida known as Carolina, were decidedly British. The land had been granted to eight Lord Proprietors by Charles II. Plantation owners celebrated Christmas with family and friends at home. The fruits of the fall harvest provided an abundant holiday meal which would have been enjoyed after attending church. Rice, roasted oysters, venison, ham, turkey, fruit, vegetables and bread would have been on the menu. Wine-quality grapes were not available in the colonies, but colonists indulged in Portuguese imports. Madeira was the wine of choice. Christmas was cause for much anticipation among plantation slaves in the Lowcountry. With the fall harvest complete, winter promised a lighter workload, and slaves typically received three days free from work at Christmastime. These three days would have been the only time off that slaves would receive in a calendar year. Slave weddings were common during this time. Winter clothing and shoes would have been issued in November after the harvest. After attending church on Christmas morning, slaves went to the main house to pay their respects to the plantation owner. Small gifts such as a scarves, handkerchiefs, or items of clothing were often given. Some slaves were allowed to market personal crops that they had harvested. Some were given stout whiskey for Christmas celebrations. This was the only time of year that slaves were able to consume alcohol. Slaves hosted enthusiastic celebrations marked by singing—fleeting joyful moments in what was an otherwise dismal existence. In 18th century Charleston, the 12 days surrounding December 25th were punctuated by balls and weddings. Compared to the whirlwind of social activity during the season, Christmas Day was relatively quiet. Joseph Manigault wrote to his brother in 1786, saying that Christmas in Charleston was “undesirable… you meet nobody but shopkeepers and tradesman.” Christmas Day was marked by church services and gathering with family at home. By the late 1700’s, fireworks were plentiful, and celebrations became more boisterous with drums, fireworks, and gunfire. Firearms were a common gift for young boys—a gift which would, of course, immediately be put to use. The results of boisterous celebrations were predictable enough. Mishaps were reported by local newspapers. In 1800 two men had limbs amputated as a result of firearm injuries. By 1806 the City of Charleston passed ordinances banning “the firing of squibs, firecrackers, guns, pistols, and other firearms unless in a military parade.” Even kite flying was illegal. The penalty was $10 for white offenders and corporal punishment for blacks. The citizens of Charleston largely ignored these prohibitions. By 1860, the city designated areas like White Point Gardens and the west end of Broad Street for legal explosions. In 1861, Charleston’s public Christmas celebrations ended. Public celebrations resumed in 1865 after the Civil War ended, but the tone was more somber than before. Charles Dickens published A Christmas Carol in 1843. It too, had a profound influence on the spirit of Christmas and produced a seasonal tendency toward charity. Dickens’s said of his book, “I have endeavored in this ghostly little book to raise the ghost of an idea, which shall not put my readers out of humor with themselves, with each other, with the season, or with me. May it haunt their houses pleasantly…”. The Christmas that we celebrate today—complete with trees, holiday cards, gifts, lights, and Santa Clause—was in place by the 1920s. Each year, it seems, we add a little more. In 2017, the Christmas season kicks off after Halloween and lasts ten weeks. Much of the festivities are centered around commerce and consumerism. Retail experts project this year’s holiday sales to reach $682 billion. The hustle and bustle of holiday shopping, parties, and travel can be overwhelming. Without question, I am an enthusiastic participant in all of these things. 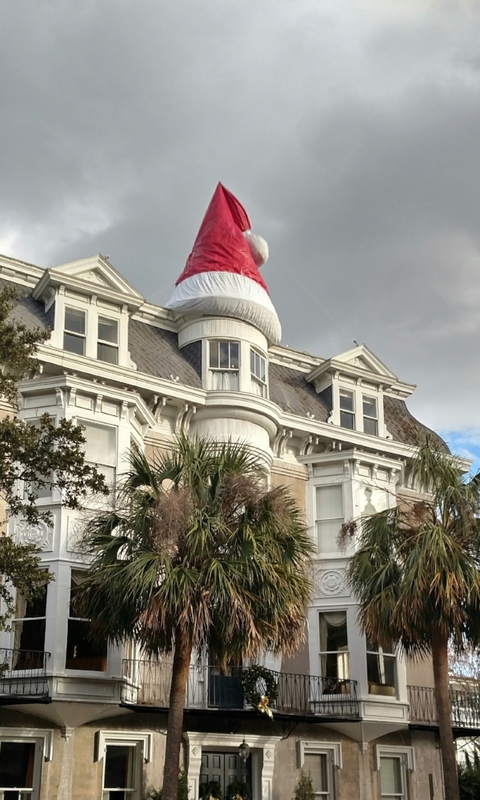 Charleston is magnificent during the holiday season. The city is positively alive with holiday cheer. I hope that joy fosters good will among all who encounter it. And there were in the same country shepherds abiding in the field, keeping watch over their flock by night. And, lo, the angel of the Lord came upon them, and the glory of the Lord shone round about them: and they were sore afraid. And the angel said unto them, Fear not: for, behold, I bring you good tidings of great joy, which shall be to all people. For unto you is born this day in the city of David a Saviour, which is Christ the Lord. And this shall be a sign unto you; Ye shall find the babe wrapped in swaddling clothes, lying in a manger. And suddenly there was with the angel a multitude of the heavenly host praising God, and saying, Glory to God in the highest, and on earth peace, good will toward men. I want to thank Valerie Perry of the Historic Charleston Foundation who offered me her guidance during my research for this Christmas blog. Valerie has served as the Associate Director of Museums for the Historic Charleston Foundation and Museum Manager at the Aiken-Rhett House since 2000. She is a popular lecturer, licensed guide, published author, and gracious host at the Aiken-Rhett House on Elizabeth Street. A tour of the Aiken-Rhett House is a must when visiting Charleston which I recommend to all of my guests. Copyright ©2018 Walking Charleston. All Rights Reserved.